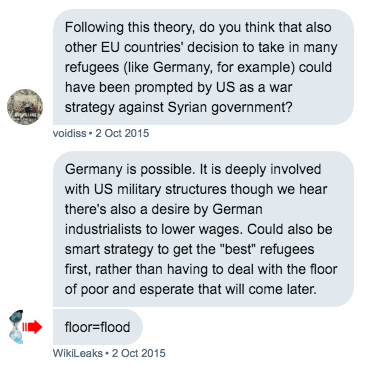 Portions of the leaked WikiLeaks + 10 chat reveal that WikiLeaks privately promoted conspiracy theories revolving around refugees, and cited an anti-vaccination website that promotes the theory that ancient aliens and visitors from other dimensions genetically engineered humanity. A copy of the chat is being prepared for publication, with redactions made to protect third party individuals’ privacy. That the quote is from an accurate reproduction of a mainstream book is irrelevant compared to WikiLeaks’ choice of sources. A Google search for that quote turns up Bibliotecapleyades.net, but it also turns up copies of the book elsewhere, including the a copy of the complete book on the Internet Archive and a second, an excerpted copy also on the Internet Archive and an on CIA’s website. The decision to cite a copy on Bibliotecapleyades.net is no different than citing something on InfoWars – regardless of whether or not the exact quote is accurate, the choice of sources to link to is revealing and it hints that WikiLeaks staff may have already been reading the website. 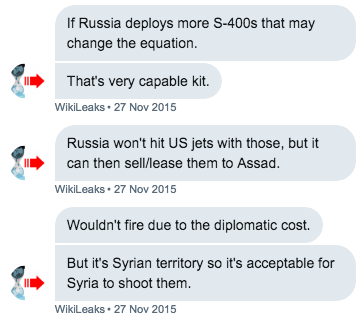 Following up on their “pet conspiracy theory,” WikiLeaks proposed that Russia might sell or lease S-400s to Assad. The logic was that Russia couldn’t directly attack the United States by shooting down American jets in Syrian airspace, but that Syria could. This theory came about a week after Russia deployed S-400s in Syria. Russia has since deployed additional S-400s to Syria. 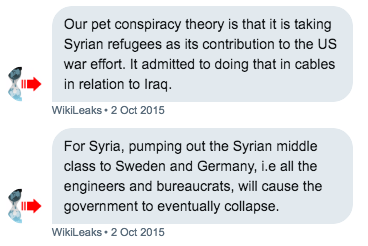 While WikiLeaks’ pet conspiracy theories aren’t be as fringe as some of the ones on the Bibliotecapleyades website they cited, each “pet conspiracy theory” provides an insight into WikiLeaks’ thinking process and their view of the refugee crisis. 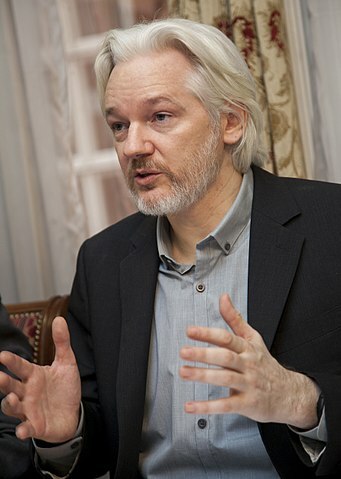 Their citing of Bibliotecapleyades while other, often more convenient and/or comprehensive, sources exist is even more revealing – and hints that the WikiLeaks staff may have already been visiting an anti-vaccination website that promotes Illuminati and ancient aliens theories, including that humanity was engineered by extra-terrestrial and inter-dimensional beings.